We at Aurora want to make philanthropy easy. Giving should make you feel good, not anxious! The best part about Dollars Make Sense is that you can make your donations gradually, and you hardly notice. But we certainly will notice! Your contribution helps us maintain our high-quality productions. Funding also supports our children’s programs that serve thousands of Gwinnett County and Metro Atlanta students. When you join Dollars Make Sense, Aurora Theatre will charge your card once a month for the amount you designate: $25, $15, $10, or whatever level is right for you! Your participation will be an enormous boost to Aurora Theatre because we will know we can count on that support each month. Make the choice to be an important part of Aurora’s success for just pennies a day! Join Dollars Make Sense Today! Help sustain Aurora Theatre’s legacy in our community. To sign up for Dollars Make Sense online, please fill out the secure form below. Aurora Theatre does not share your payment or email information with anyone, and your credit card information is transmitted securely through CaptainForm’s SSL encryption. If you prefer to sign up over the phone, call the Development Office at 678.226.6229. We will charge your card on the last business day of each month until you tell us to stop. To cancel, contact Liz Santamaria, Director of Institutional Giving at 678.226.6229. Aurora Theatre is a 501(c)(3) nonprofit organization with the Federal EIN 58-245-0282. Your Dollars Make Sense contributions are tax-deductible to the extent allowable by law. Aurora Theatre sends cumulative annual donation receipts in January for the prior calendar year. 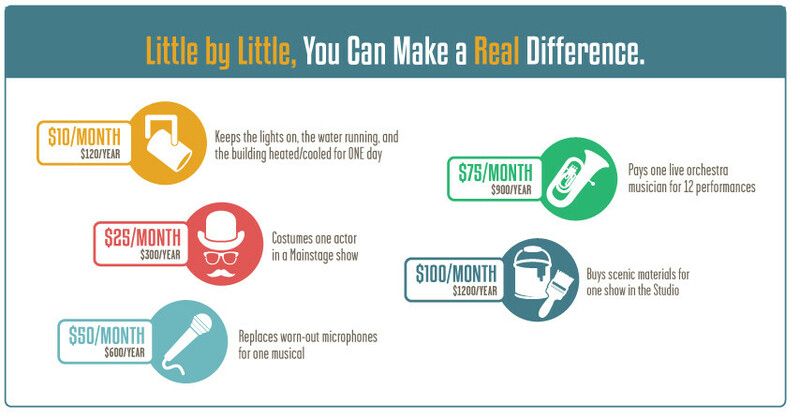 Your monthly donation sustains Aurora Theatre's impact in our community. Sign up below to designate the amount you wish to donate each month through our secure (SSL encryption) and easy to fill out donation form below. We are grateful for your support! If you prefer to sign up over the phone, please call the Development Office at 678.226.6229. Important: Your card will not be charged when you submit the form. We will charge your card monthly on the last business day of the month. By clicking the Submit button, I authorize Aurora Theatre to charge the card provided each month for the amount designated. Aurora Theatre will continue to charge your card monthly until the card owner tells Aurora Theatre to stop by contacting the theatre at 678.226.6222. Aurora Theatre is a 501(c)(3) nonprofit organization with the Federal EIN 58-2450282. Donations to Aurora Theatre are tax-deductible to the extent allowable by the IRS. Aurora Theatre sends cumulative annual donation receipts in January for the previous calendar year.